Refuting rationality or narrative, Adam Pendleton incorporates cultural artefacts that he quotes and reconfigures within his work. This is a strategy he calls ‘Black Dada’ which is taken from Amiri Barak’s poem 1964 poem ‘Black Dada Nihilismus’. In the gallery, natural light picks out letters, diagonals and patterns silkscreened in glossier ink laid over matt black on canvas. Two letters ‘A’ sit at 90 degrees to each other, separated by the thrust of a diagonal stripe, which cuts the image into opposing trianglar shapes with cropped ends. In the ‘Black Dada’ paintings he refers to Sol LeWitt’s Open Cube sculptures so that the pictures adopt graphic fragments from pre-existing cultural systems. In another series, ‘System of Display, Pendleton silkscreens photographs of Pablo Picasso’s ‘primitive’ paintings exhibited at Documenta onto plexiglass and mirror. Form, context and source are translated across time and medium into new, self-sufficient objects. In a separate work, ‘Black Dada’ disconnected lines of text, some appropriated and some written by Pendleton, flow like a stream of consciousness across the creased and smudged support. 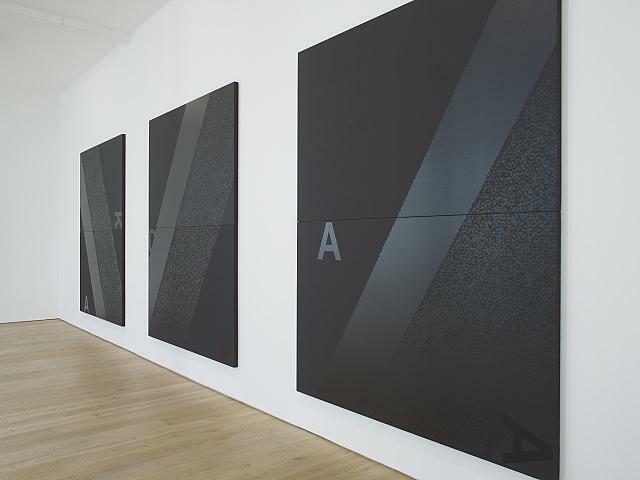 Letters taken from the phrase ‘Black Dada’, a newspaper image of an unidentified man and blocks of geometric ink randomly float across the sequence of words referring to Sol LeWitt, art history and sexual desire. Arguably the most convincing work ,‘Larry Hinton (white)’, comprises three panels that reproduce an old promotional photograph of an actor whose agent’s and photographer’s details are stamped in the corner, connecting it to a pre-existing functionality. The performer’s face is hung on the wall but two adjoining planks of irregular size sit stranded on the floor. Combining familiar elements of a billboard, casting headshot and publicity still, Larry’s pose is both cocky and debonair in his three piece suit, resonant of 1970s ‘Blaxploitation’ films. Pendleton’s concept of ‘Black Dada’ does not appear to carry much intellectual coherence but instead employs an historic strategy of dislocation and reconfiguration. History surges forward into his work but leaves us awash in imagery and text that feels drained of signification beyond loose association. The work employs a tradition of anarchic sampling, but loses discernible satirical urgency or relevance on the way.